Get Free ground shipping and handling on all orders. Valid in Canada only. 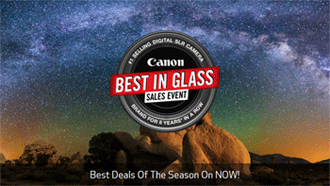 Up To $580 Off on BEST IN GLASS sale event. No code required. Up To 50% Off Printers. No code required. Get up to 25% Off on select powershot cameras! No code required. Get 15% off Select Accessories. No code required. Save up to 15% on document scanners. Limited time offer. Save up to $300 on selected consumer camcorders. No code required. The Canon eStore is intended for customers purchasing products for personal or small office/home office use. Orders are limited to no more than ten (10) of any one item. Resale of products purchased under these Terms of Sale is prohibited. This resale prohibition is a material condition to Your rights under these Terms of Sale, and it is agreed that any direct or indirect distribution, transhipment and/or sale of products by You or others purchasing through You will be a material breach of these Terms of Sale and will result in serious and irreparable harm to Canon Canada for which money damages will not be adequate remedy. In the event of such breach, You agree that Canon Canada, in addition to any other remedies it may have at law and/or in equity, will be entitled to injunctive relief to prevent any threatened or continued breach and to specifically enforce this provision. They will not knowingly accept any order from a person under the age of majority in their respective province or territory of residence. You confirm that You are not under the age of majority.